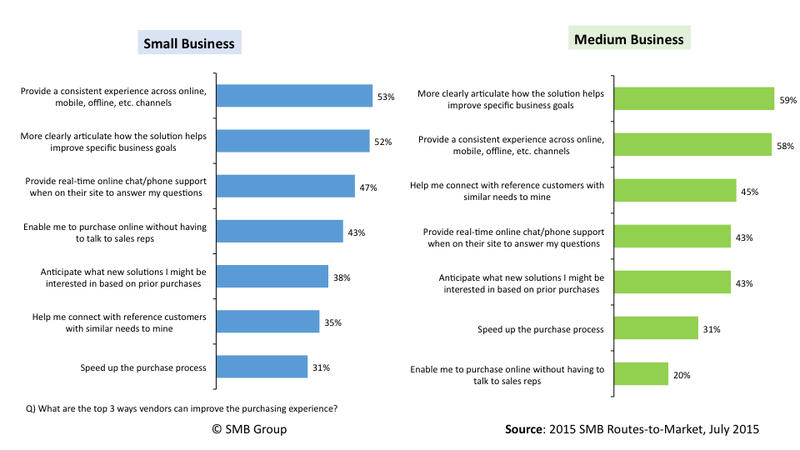 Are You Keeping Pace With Your SMB Customers? The good news for tech vendors: SMBs are bullish on their own growth, and on using technology to help achieve that growth. The bad news: tech vendors may not be doing a good enough job helping SMBs understand, evaluate and buy the tech solutions that will best help their businesses. SMB Group recently completed our 2015 SMB Routes to Market Study, which provides an in-depth look at U.S. SMB (small businesses: 1-99 employees, medium business: 100-999 employees) technology adoption, the decision-making process, and the buying cycle. Among the findings, we learned that “figuring out how different technology solutions can help my business” is the number one technology challenge for small businesses, and the number three challenge for medium businesses. SMBs need tech vendors to provide them with a more informative, consistent purchasing experience to help them punch through the confusions knothole. Though the priority rankings differ a bit between small and medium businesses, the top two asks for both small and medium businesses are for vendors to provide a consistent experience across online, mobile, offline and other channels and to more clearly articulate how the solution helps improve specific business goals. Number three for small businesses is the desire fro better real-time online chat/phone support to answer questions, while for medium businesses, its help in connecting with reference customers with similar needs. The “SMB market” has always been a tough nut to crack as it actually comprises many different diverse markets. 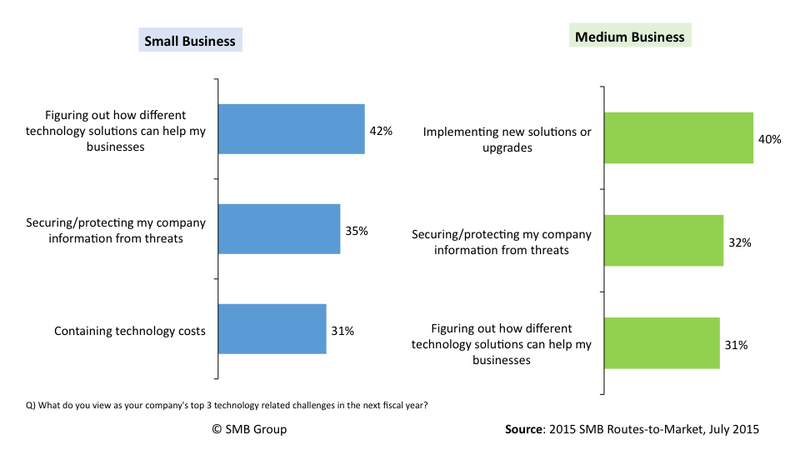 In addition to standard employee size and industry segmentation, SMBs vary widely in terms of business maturity, attitudes about technology, and a host of other variables. Furthermore, it’s a very volatile market: about 50% of new businesses fail within the first five years. Today, these age-old challenges are compounded by the fact that the digital, social and mobile revolution raising SMB buyers’ expectations of tech vendors’ across solutions, marketing, sales add service. As competition for SMB mindshare and market share continues to rise, tech vendors will need to work smarter to earn SMB dollars. Vendors need to do a better job of understanding the intricacies of the SMB market so that they can personalize content to nurture buyers along the their journey, providing them with an informative, helpful and consistent purchasing and service experience across channels. Please contact Lisa Lincoln at (508) 734-5658 or lisa.lincoln70@smb-gr.com for more information about the 2015 SMB Routes to Market Study (including a Table of Contents), or to order.